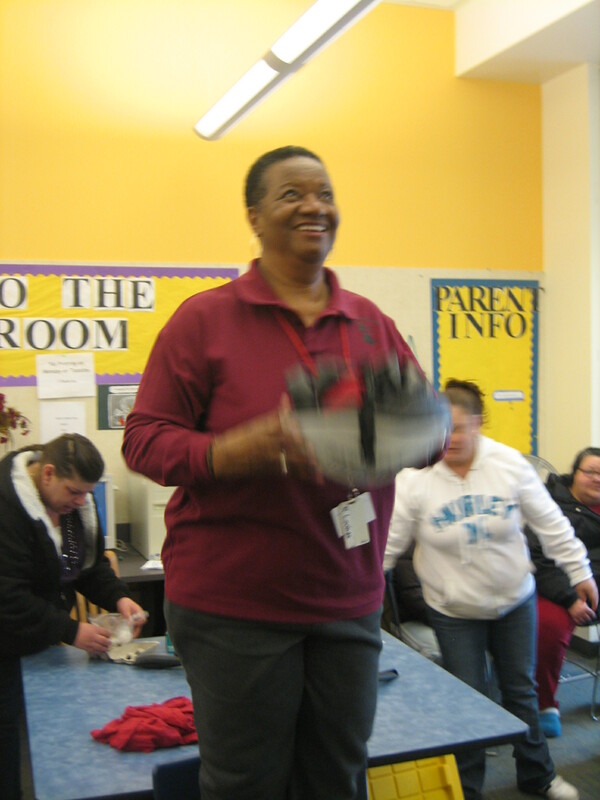 Rosie is the Family Resources Coordinator at Rosa Parks Elementary School. She invited the We All Can Ride bike committee to the parents’ Friday morning coffee group to demonstrate the importance of wearing bike helmets. A group of around 25 adults attended the meeting. For some parents, riding a bicycle is not a part of their lives. A few parents never learned how to ride, however, they all have children who ride bicycles and share the common concern of keeping them safe. 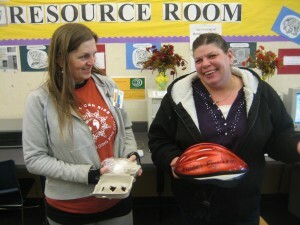 Yvette and Susan, Community Bike Educators from We All Can Ride, led two helmet safety lessons. First, they asked the parents to wrap an egg with rags and bike tubes, strap it inside a helmet, and drop it from a considerable distance. Most of the eggs survived and the parents all cheered, however, the last egg cracked under pressure. Next, Yvette showed the group how to properly fit and adjust a helmet. “I see many people with helmets back here,” she said while placing the helmet on the back of her head. “That’s not safe. Remember the two finger rule on your forehead.” Yvette noted that having a properly fitted helmet is just as important as the helmet itself. A poorly fitted helmet can pop off of a head when involved in a crash. “Do helmets expire, like car seats?” one parent asked. The parents at Rosa Parks expressed their gratitude for the bike safety lessons. Many were interested in learning more about the Bicycle Repair Hub, which sits directly across the street from the elementary school. Yvette and Susan passed around fliers, and explained that the Bike Hub opens again for the season beginning on Saturday, and offers free repair services for residents at New Columbia. It is great to see the momentum building for bike safety education in New Columbia. Yvette and Susan both appreciated the opportunity to connect with parents and teach them valuable lessons that will keep their children safe in the future. As word of the Bike Repair Hub and We All Can Ride spreads around the community, more residents will take advantage of this resource and the opportunity to learn about basic bicycle maintenance, repair, and safety.